Get The Facts: Does Herbal Tea Have Caffeine? With the variety of herbal tea options, it is often difficult to know which teas contain caffeine and which do not. Some tea drinkers desire the stimulation-boost from the caffeine or seek out the diuretic properties, while others need to avoid caffeine for personal or medical reasons. When choosing the best types of herbal teas for you, consider the source to determine the caffeine content. Also, speak with you doctor or nutritionist to determine if a caffeinated drink is the best option for your health. The leaves of the tea plant naturally contain caffeine and these types of herbal tea drinks, will have trace amounts of caffeine. The differing amounts of caffeine in each vary according to the leave fermentation process. For instance, green tea leaves are unfermented which is gives it the lowest caffeine content of the three. In the middle is oolong tea which has partially fermented leaves. Black tea has the highest herbal tea concentrate of caffeine, approximately two to three times the amount of green tea, since its leaves are fully fermented. Not all herbal teas contain caffeine. Many teas are called teas, but do not originate from tea leaves and therefore are considered caffeine free. These contain other herbs, spices and ingredients to provide a variety of flavors, but without the caffeine. Unfortunately, when teas are not made from the tea leaves, you also lose some of the anti-oxidant benefits. Other herbal teas may add ingredients to boost the health benefits, so check the ingredients of your herbal teas to determine if you are drinking the beverage for taste or for health. According to the August 2006 issue of International Journal of Food Sciences and Nutrition, herbal teas with the highest anti-oxidant properties are scarlet pimpernel, sweet basil, green tea and lemon balm. Your source for caffeine, anti-oxidants and flavor can vary each day depending on your personal tastes. Caffeine is a stimulant and a diuretic, and you may have heard the cautions about too much caffeine. These include becoming addicted to the substance or experiencing physical symptoms such as nervousness, anxiety and irritability. 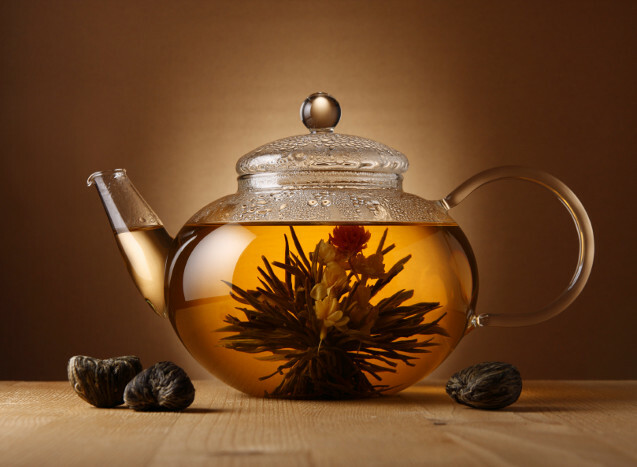 Use caution when drinking caffeinated herbal teas in the evening, as it may interrupt your sleep patterns. Even a loose herbal tea may contain caffeine, but these also have a boost in the anti-oxidant properties. When the leaves are crushed in tea bags, or loose to put steeped in a tea ball, the health-improving benefits increase. More anti-oxidants are released when the leaves are crushed. The caffeine benefits can also be found in capsules that contain crushed green tea leaves or in liquid extracts that provide green tea ingredients. In typical conditions, drink between two and three cups of caffeinated herbal tea a day and always speak with your physician to determine if the herbal tea with interfere with any medications or medical conditions such as high blood pressure. Since caffeine is a diuretic, it may cause a drop in blood pressure, which should be monitored by your doctor.